One of five states bordered on the south by the Gulf of Mexico, 8,300 square miles (almost 16%) of Louisiana are under water. The Mississippi River flows along much of the state's eastern border with Mississippi and empties into the Gulf of Mexico. Other major rivers in the state include the Atchafalaya River, Ouachita River, Red River, and Sabine River. Major lakes include Calcasieu Lake, Catahoula Lake, Grand Lake, Lake Maurepas, Lake Pontchartrain, Toledo Bend Reservoir, and White Lake. Chances are good that there are many underwater archeological sites in Louisiana's offshore and riverine waters. Some of the types of sites found in the Gulf of Mexico are Native American sites that became inundated when sea level rose after the last Ice Age. Others are sunken ships of exploration, Spanish plate fleet wrecks, sunken 19th century steamships, and wrecks from the Civil War, World War II, and other conflicts. Many shipwrecks lie on the bottom of the Mississippi River and the state's other major rivers. One of the first historic shipwrecks discovered off the coast of Louisiana is El Nuevo Constante. Part of the New Spain Fleet, El Nuevo Constante was sailing from Veracruz, Mexico to Cadiz, Spain when it blew aground during a hurricane in 1766. Another ship in the convoy, the Corazon de Jesus y Santa Barbara, wrecked further north. Discovered 213 years later, the wreck of El Nuevo Constante was studied by archeologists and historians. 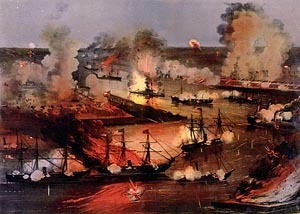 During the Civil War, Louisiana witnessed many naval battles like the one in April 1862 when a Union fleet of 17 warships advanced on New Orleans. In the ensuing battles near Fort Jackson and Fort St. Philip, a number of vessels were sunk or destroyed including the steamer CSS Governor Moore, the ironclad CSS Louisiana, the ironclad CSS Manassas, and the gunboat USS Varuna. Who takes care of Louisiana's underwater archeological sites? The Louisiana Division of Archaeology in the Department of Culture, Recreation and Tourism is charged with creating and operating the state's archeology program which includes all sunken or abandoned ships and wrecks of the sea or rivers and their contents. All sunken or abandoned pre-twentieth century shipwrecks and their contents located on or under the surface of state-owned lands belong to the state of Louisiana and are administered and protected by the Department of Culture, Recreation and Tourism. To conduct a survey, an excavation or recover archeological materials on state-owned lands, including submerged lands, applicants must obtain a permit from the Secretary of the Department of Culture, Recreation and Tourism. Permits are only issued for scientific and educational projects to qualified entities. All recovered materials remain the property of the state. What laws concern underwater archeology in Louisiana? The Louisiana Archaeological Resources Act is codified at Louisiana Revised Statutes Title 41 Chapter 13 � 1601, et seq., and related regulations can be found at Louisiana Administrative Code Title 25, Part I, Chapter 1 � 101, et seq. These laws direct Louisiana to protect and preserve its prehistoric and historic properties, artifacts, treasure troves, and objects of antiquity of historical value or of interest to the public. This includes abandoned prehistoric or historic settlements, sites, properties, sunken or abandoned ships, or other objects, or any part thereof relating to the history, government, and culture of the state.